October–the time of year when this blog sometimes takes a turn towards such things as local legends, folklore and cemeteries. With that in mind, not too long ago, I sought out the oldest cemeteries in 14 towns on the South Shore of Massachusetts. That is, the oldest in each town, not simply the oldest in the region, which would all be grouped along the coast and would leave out many of the “newer” inland towns. To present these sites in chronological order is almost impossible as the dates of establishment for some of the earliest burying grounds are rather muddy. Perhaps it makes most sense to present them geographically, roughly from north to south. In part one, I’ll cover the cemeteries in the northern half of South Shore. An older grouping of stones behind the Old Ship Church. Thomas Barnes’s 1672 stone located near the Settlers Monument is likely the oldest gravestone on the South Shore. 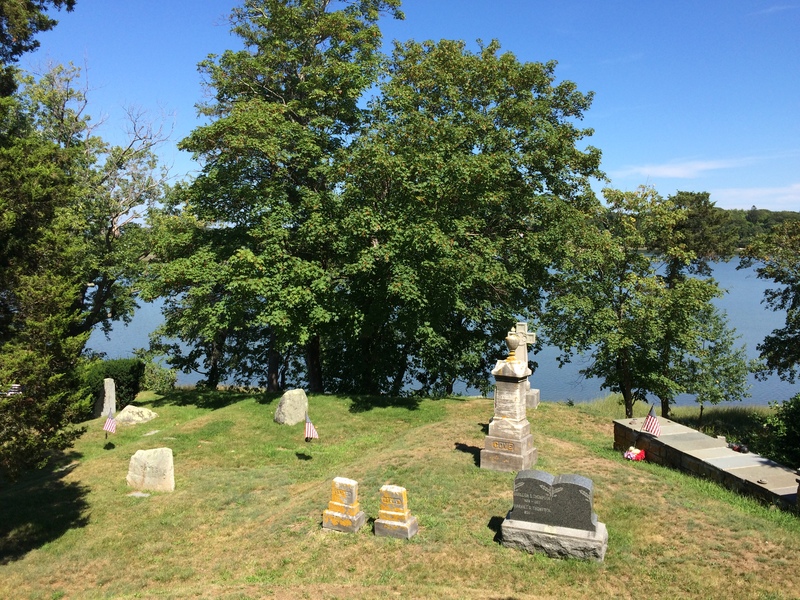 Despite the overgrown condition of this particular knoll, the large Hingham Cemetery is well-known as one of the most beautiful “garden cemeteries” on the South Shore with remarkable statuary and rare trees. 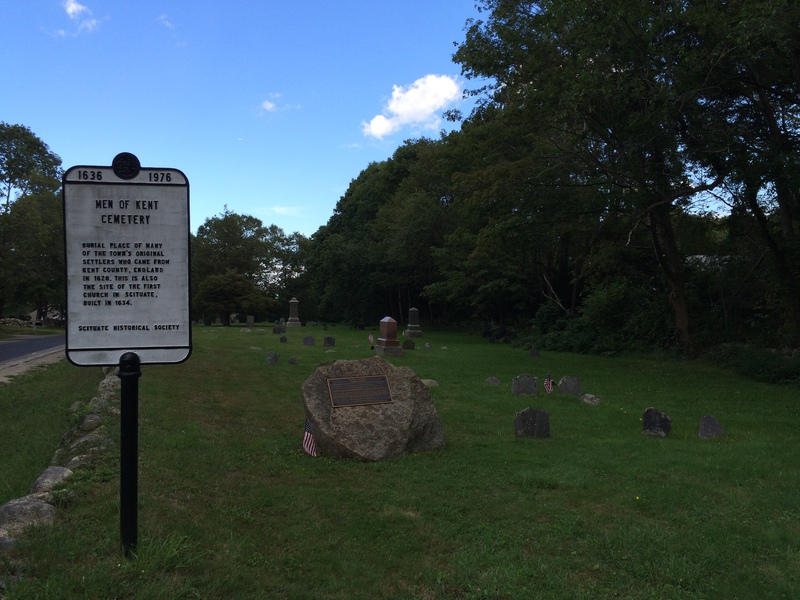 Hingham Cemetery: Located behind the Old Ship Church at 107 Main Street. This Massachusetts Bay Colony town first began to be settled by English colonists in 1633 and then was more firmly established with the arrival of a group of settlers in 1635 (one segment of the Great Migration) from the vicinity of Hingham, England led by Rev. Peter Hobart. The first meetinghouse was built at some point not long after this (about where the Old Derby Academy building is now) with the burying ground being established behind it. The oldest known burial here is that of William Hersey, died 1638, but his original stone does not survive. The oldest marker is for Thomas Barnes, died 1672, which (as far as I have been able to determine) is the oldest grave marker in the South Shore region. His stone, however, is not in its original location, having been moved along with several other stones when the adjacent road was altered in the 1830s. Hingham’s second meeting house, known as the Old Ship Church, built 1681, is the oldest church in New England (perhaps, by some estimations, in the nation) and is well worth a look. Other notable sites here include the grave of Maj. Gen. Benjamin Lincoln who received the British surrender during ceremonies at Yorktown, and the grave of Massachusetts Civil War Governor John A. Andrew. Cohasset Central Cemetery: Located along Joy Place on a set of steep knolls abutting Cohasset harbor, this is one of the most picturesque cemeteries on the South Shore (maybe second only to Burial Hill in Plymouth). Cohasset was originally known as the Second Parish of Hingham, set off as a separate town in 1770. Portions of Cohasset were divided up for cattle pasture in the 1630s but the area was not settled by the English until 1670. Some of the earliest inhabitants of the Second Parish were interred in Hingham’s burying ground. The first known burial here in Cohasset took place in 1705 (Margaret Tower), but her stone has been proved to be a later addition. The oldest extant marker is for Sarah Pratt, died 1706. Also of significance here is a memorial placed over the grave of 45 out of the 99 victims of the 1849 wreck of the St. John, a famine ship from Ireland. Thoreau, who visited Cohasset on his way to the Cape just days after the disaster, devoted a chapter of Cape Cod to dramatic scenes he witnessed in the wake of the terrible shipwreck. The graves of Major General Zealous B. Tower (great name) who had an accomplished record during the Civil War, and Sgt. Levi Gaylord, a Civil War Medal of Honor recipient from Cohasset, are located here as well. Scituate, Men of Kent Cemetery: Located on Meetinghouse Lane near Scituate harbor. Scituate was settled early and somewhat informally, as an offshoot of the village of Plymouth. Around 1626, several Plymouth settlers, including William Gillson, Anthony Annabel, Nathaniel Tilden, Edward Foster, Henry Rowley and others had established dwellings and small farms here. These men were from Kent County, England, and were therefore known as the “Men of Kent.” By 1633 others had joined them and land was officially granted to these planters to set up a small township in that year. A meetinghouse had already been built along what is now Meeting House Lane around 1628. The burying ground was likely established shortly thereafter. The oldest stone in the cemetery is that of Capt. John Williams who died June 22, 1694, aged 70. 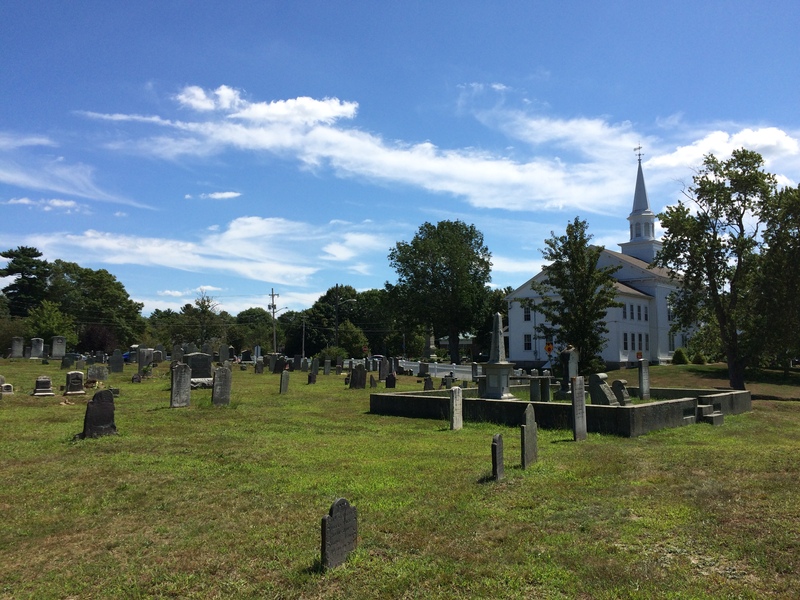 Norwell, Second Church Cemetery: Located at the corner of Main Street and Trunnel Lane, this small, abandoned and overgrown cemetery has a forlorn quality that stands in contrast to other manicured cemeteries in this survey. It thus has its own sort of charm about it, being difficult to spot and the few remaining stones appearing all the more ancient. 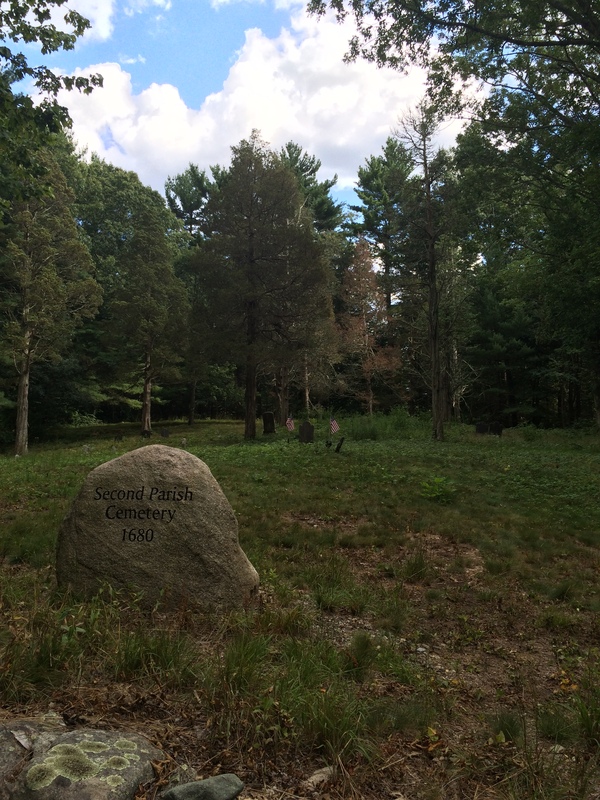 This is not the first cemetery established within the bounds of what is now Norwell. In 1644, settlers in this area organized as the parish of South Scituate, built a meeting house and established the Second Church Graveyard at Wilson Hill, just down the street from this site (at the corner of Main Street and Old Meetinghouse Lane). No trace of that first cemetery survives, all the grave markers are long gone, though one might presume that some of the interred remain. 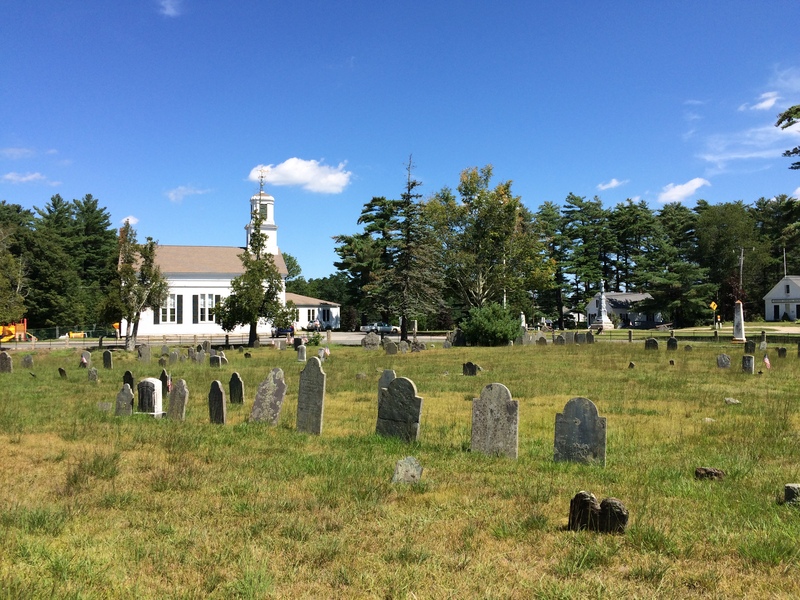 The Second Church Cemetery is therefore the oldest existing cemetery in Norwell, established sometime around 1680. The oldest stone is that of William Barrels, died 1689. 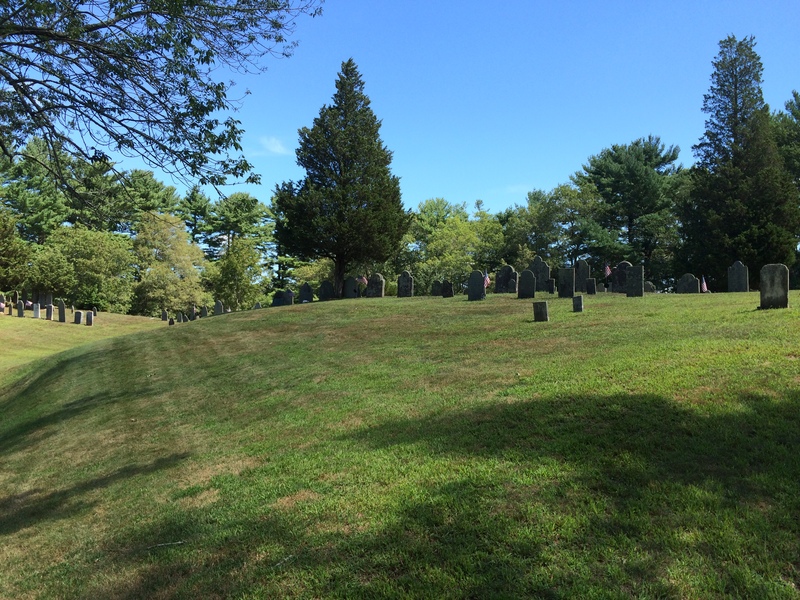 Hanson, Fern Hill Cemetery: Located on High Street, the oldest section of this large cemetery (still in use) is atop a knoll known as “Gravely Hill.” The area was originally part of Duxbury, then part of Pembroke when that town was set off in 1712. Hanson at that time was known as the west precinct of Pembroke and constructed its own meetinghouse in 1746. The precinct was not set off as the town of Hanson until 1820. The burying ground on Gravely Hill came into use slightly before the construction of the first meetinghouse. The oldest stone here is that of Isaac Cushing, died 1745 at age two. There is a truly unique and mysterious stone here, that of Capt. Richard Chapman which is, at times, decorated by a British flag. The stone reads, “In memory of Capt. Richard Chapman belonging to Whitby, Yorkshire in England, who died in Pembroke, Nov. the 2nd, 1778 in the 34th year of age. By Strangers honored and mourned.” I do not know the full story on this individual and cannot find it published anywhere, however the oral tradition I’ve heard is that he was an officer in the British army during the Revolution who somehow ended up in Hanson, fell ill, and died very far from home. Questions abound. Pembroke, Center Cemetery: Located across from the Pembroke Town Hall, 100 Center Street. Part of Duxbury until 1712, Pembroke was settled by English colonists beginning in the late 17th century. 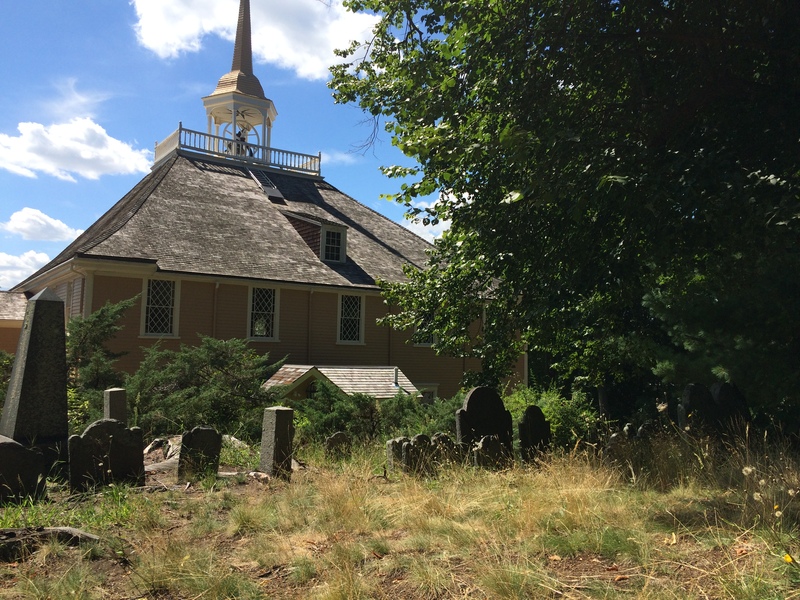 The first meetinghouse was constructed in 1708 on the site of the existing First Church, while Pembroke was still a precinct of Duxbury, and the burying ground was likely established about the same time adjacent to the meetinghouse. According to legend, the site had earlier been used as a Native burying ground. The earliest known burial here was that of Anne Thomas who died in 1715. Her stone does not survive. The oldest stone is that of William Tubbs who died in 1718. Cohasset Central Cemetery Association, “History of the Cemetery”; E. Victor Bigelow, A Narrative History of the Town of Cohasset, Massachusetts, (1956). L. Vernon Briggs, The Church and Cemetery Records of Hanover, Mass: History and records of the First Congregational Church, Hanover, Mass., 1727-1865, and inscriptions from the headstones and tombs in the cemetery at Centre Hanover, Mass., 1727-1894, (1895) pp. xi, 257. This entry was posted on Saturday, October 10th, 2015 at 10:50 am	and posted in American Colonial History. You can follow any responses to this entry through the RSS 2.0 feed. Excellent article Patrick. As you know I am interested in pre-colonial South Shore. All historians forget to say “colonial cemeteries”, there are Native red paint burials documented throughout the South Shore from 10,000 years before present to the 1600’s. I could give you some info on them if you are interested. Thanks, Sheila. Yes, I’d be very interested in information about Native sites. I’ll enjoy looking into these. Thanks, Sheila!